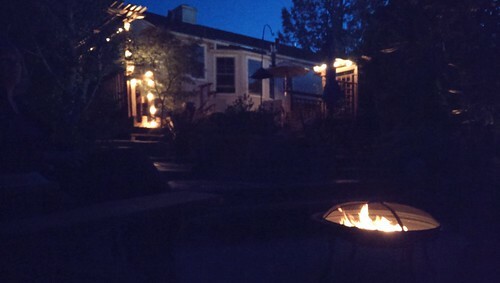 The long-anticipated goal of having a campfire in the Camp Arrowhead section of the backyard has now been realized. Along with the entertainment of burning things, we get to spend more time with the night-time versions of animals that frequent the yard. Not long after dark two Opposums came through. I’m sure the Raccoon and free-roaming Cat made appearances as well. The backyard includes two entrance and/or exit doors, created by and for these animals. 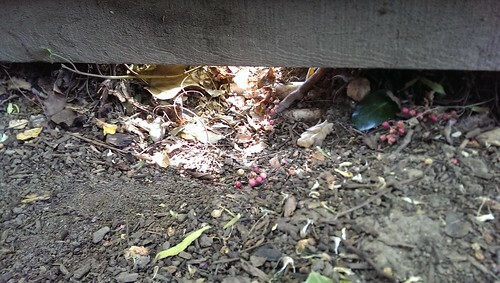 One is quite noticeable, under the fence near the deck. 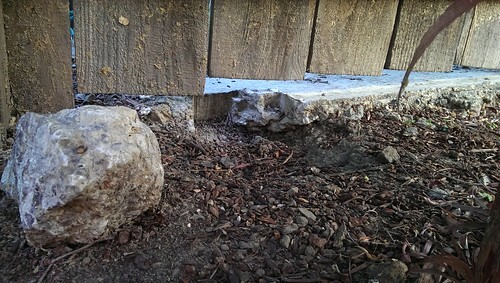 I’d placed that rock in their way once, before I adopted my current free-wheeling attitude about animals in the yard. They easily pushed the rock aside and restored access. Today I found another animal doorway in the neglected North corner of the yard. I’ve considered placing something like a doormat here that would capture the animal footprints, so I can identify the different styles that are moving through. Not sure yet how to do that in a way that will get a readable track but not discourage traffic or bother the animals.